Even busy people need to get dinner on the table. These make-ahead casserole recipes are just what the doctor ordered for nights when you just don’t have time to cook. Clear out some freezer space for these great recipes and stop worrying about supper while at work. What's better than pizza and trumps plain spaghetti? Why, putting the two together and making it ahead of time so you can have both on a weeknight, of course! This recipe also sneaks a little spinach into your kids' diet. To freeze, just assemble completely and wrap it plastic wrap. Defrost in the refrigerator overnight before baking. 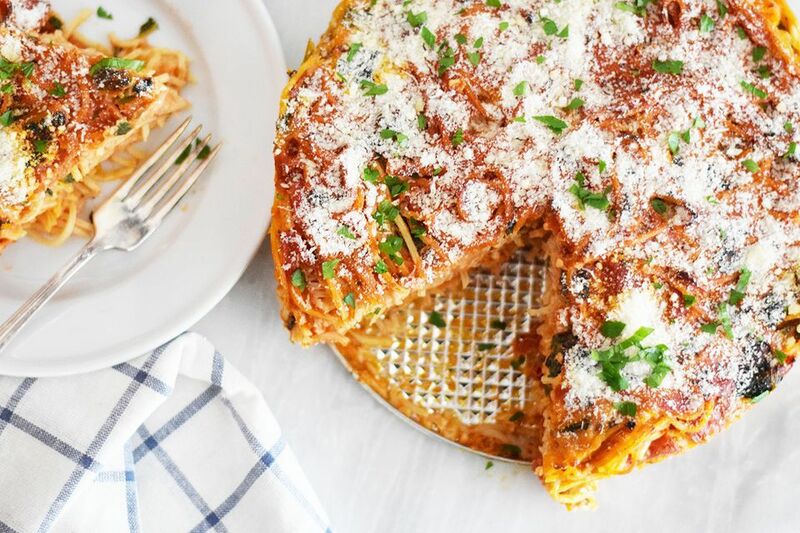 This vegetarian lasagna uses jarred spaghetti sauce for quick and easy preparation, but feel free to make your own, too. It freezes well, so make it on a weekend and have it ready for a busy night later. Just assemble it up to the baking step, then thaw overnight in the refrigerator. Allow for an extra 10 to 15 minutes of bake time to get it bubbling and gooey. No need to spend the night hovered above the stove stirring—this creamy make-ahead baked macaroni and cheese cooks in the oven. Just bake it, let it cool completely, then tightly wrap and freeze. Thaw it overnight in the refrigerator, then sprinkle additional breadcrumbs over the top before reheating for that crunchy goodness. Freeze these vegetarian stuffed pasta shells and sauce in a casserole covered with sauce or individually for a quick solo lunch or dinner. Simply prepare the shells and cover with sauce and cheese, then refrigerate until cold. Freeze for up to 3 months and thaw overnight in the fridge when you’re ready to eat. You're just a couple of cans of tuna away from this easy, satisfying casserole. Just assemble, wrap tightly in foil, then defrost completely in the refrigerator before baking. It also lends itself well to experimentation: Switch up the breadcrumbs for French fried onions, cheese crackers, or potato chips; use cream of celery instead of cream of mushroom soup. You can also make your own sauce, add sliced mushrooms, mixed vegetables, or chopped pimentos. Quiches are perfect for making ahead of time. They keep well in the freezer and are easy to reheat either in the oven or even the microwave. Use any type of cheese you have on hand, add veggies like broccoli or asparagus, and mix up the type of meat or even leave it out for a vegetarian breakfast-for-dinner. The sky’s the limit! Don’t be intimidated by the length of this company-worthy brunch egg bake—it’s much easier than it looks. Assemble the casserole and wrap before baking, then thaw in the refrigerator overnight before you stick it in the oven. It will take about 60 to 75 minutes uncovered to get nice and golden brown. 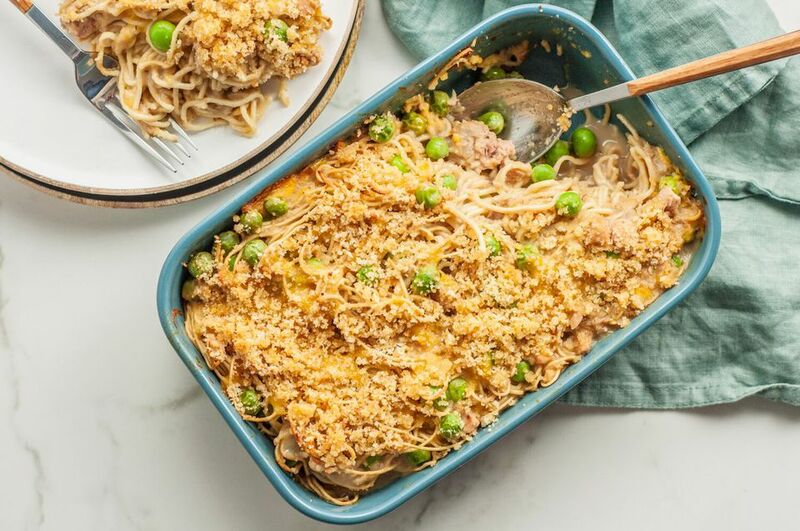 Whip up this simple, hearty pork and noodle casserole ahead of time for an easy weeknight meal. If making from the refrigerator, take it out half an hour ahead of time and then bake as directed. You can also bake and freeze it, but sprinkle extra breadcrumbs over before reheating, for crispy topping. Feel free to sleep in with this simple breakfast sausage and egg bake. Use your favorite smoked sausage flavor and just wrap tightly and freeze after it’s assembled. Let it thaw completely before baking until it's browned around the edges. For a stick-to-your-ribs meal, this chicken and potato casserole checks all the boxes. It also makes a great post-Thanksgiving meal—just use cubed leftover turkey instead. Bake it completely, freeze, and thaw in the fridge overnight for a comforting weeknight dinner. Enjoy the flavor of stuffed peppers in half the time with this delicious "unstuffed" pepper casserole. Make it ahead and let it cool before freezing, tightly wrapped. Let it come to room temperature and reheat with extra cheese sprinkled on top. If you’ve got leftover mashed potatoes on hand, you’re already halfway to this hearty and affordable cottage pie. Just sauté the beef, assemble the pie, and stick the wrapped dish in the freezer. Let it come to room temperature before baking until hot and bubbly. Stick it under the broiler afterward for a few minutes to crisp up the top. When making pasta-based casseroles, undercook the noodles just a little so it doesn’t get mushy when you finish it off. This versatile, five-ingredient dish lends itself well to experimentation. Just remember to bring it to room temperature before reheating it from the freezer. Use leftover ham from the holidays in this creamy, satisfying ham and manicotti casserole. If you make a few, you can freeze them and pull one out whenever you need a meal. Assemble and bake right away, then wrap and freeze for up to three months. Then simply thaw it in the fridge, then sprinkle with Parmesan before rebaking. Making this five-ingredient tortellini casserole ahead of time couldn’t be easier. Just assemble it with the still-frozen tortellini, wrap and freeze the whole thing, then bake as directed when you’re ready. For a more substantial meal, add a package of frozen meatballs. If making these zesty chicken enchiladas with green sauce ahead of time, let them cool completely before sticking it in the freezer. Wrap it tightly before freezing, and let it thaw completely before warming in the oven, covered with foil.